Standard Delivery is available for UK Mainland addresses only. Deliveries are made by TNT Monday to Friday. Delivery does require a signature. 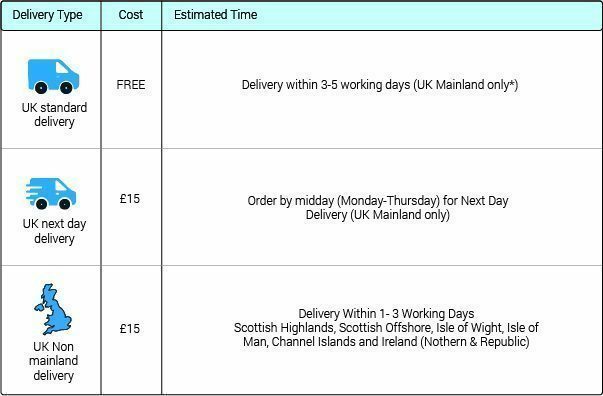 Next Day Delivery is available for UK Mainland addresses only. Deliveries made by TNT Monday to Friday. Orders placed before Midday Monday to Thursday will be dispatched on the same day and delivered the Next Day. Orders placed on a Friday (before Midday), will be dispatched on the same day, your order will arrive on the following Monday. Orders placed on a Friday (after Midday) Saturday or Sunday will be dispatched on the following Monday and delivered Tuesday (excluding Public Holidays). Deliveries made by TNT Monday to Friday. Orders placed before Midday Monday to Thursday will be dispatched on the same day and delivered in 1-2 working days. Orders placed on a Friday (before Midday), will be dispatched on the same day, your order will arrive on Monday or Tuesday of the following week. Orders placed on a Friday (after Midday) Saturday or Sunday will be dispatched on the following Monday and delivered in 1-2 working days (excluding Public Holidays). If you are not happy with your item, please return in the original packaging within 28 days. Goods must be returned postage paid. Please contact sales@fleetdesign.co.uk to arrange a return. Once we receive the goods refund of the purchase price will be refunded by the same method as the payment was made. Postage costs will not be refunded. We will always do our best to ensure that your product arrives correctly and in perfect condition. Sometimes, however, mistakes do happen, we want to be able to resolve them for you quickly and efficiently. Please return in the original packaging within 28 days. Please contact sales@fleetdesign.co.uk to arrange a return. Once we receive the goods refund of the purchase price will be refunded by the same method as the payment was made. We will cover any postage costs for faulty, damaged or incorrect goods. Upon receipt of the kit, open the packaging and inspect the kit for any transit damage. Check that it is the correct kit for the vehicle, that all the components are included, and they fit the vehicle. DO NOT BEGIN TO FIT THE KIT if incorrect this will invalidate our returns policy.